ON THE ROAD out of Pokola, I feel excited. 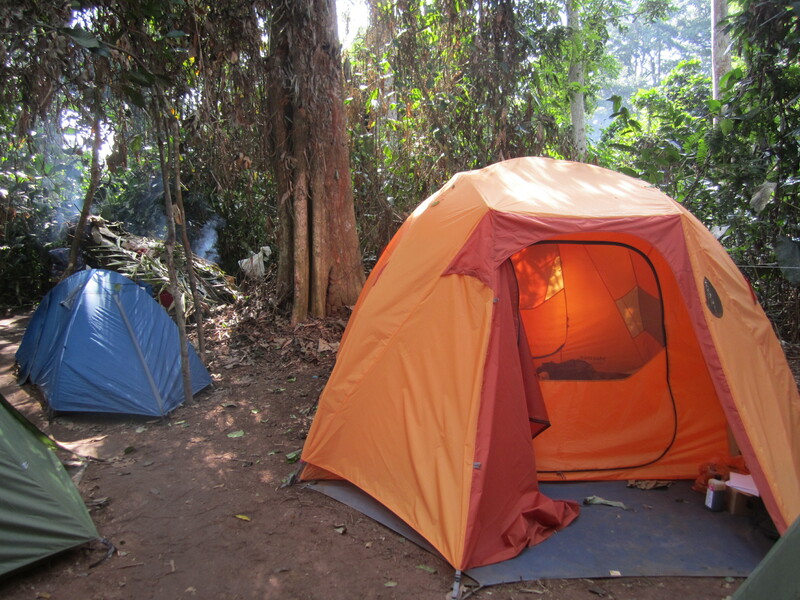 It’s been two weeks since we got to Congo, and now at last we’re entering the forest. At one point not far out of town, trees form a green tunnel, bending over the road. 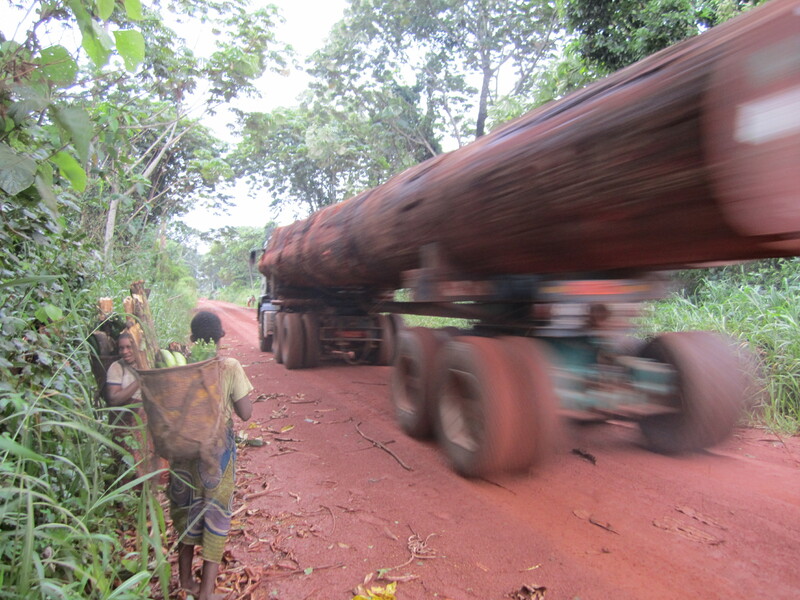 We pass huge trucks speeding in the opposite direction loaded with gigantic logs: tree trunks, bigger than I’ve ever seen, being hauled out of the forest. The road, which was merely a footpath until CIB exploited the forest around here in the late ’90s, sees at least one large truck and several taxis each day, as well as motorcycle traffic — mostly Bantu traders who travel between Pokola and the villages around Minganga, buying up forest products (bushmeat, and also the mongongo leaves used for wrapping street food) and selling produce from town (tobacco and alcohol, rifle cartridges and shotgun shells, and food staples such as manioc and taro). The place where we settle is a roadside camp. The people who live here, previously known to outsiders as Pygmies, are now commonly referred to as autochtones, a term (derived from Greek words meaning “[from] the ground itself”) that’s equivalent to the word ‘indigenous’ in English. 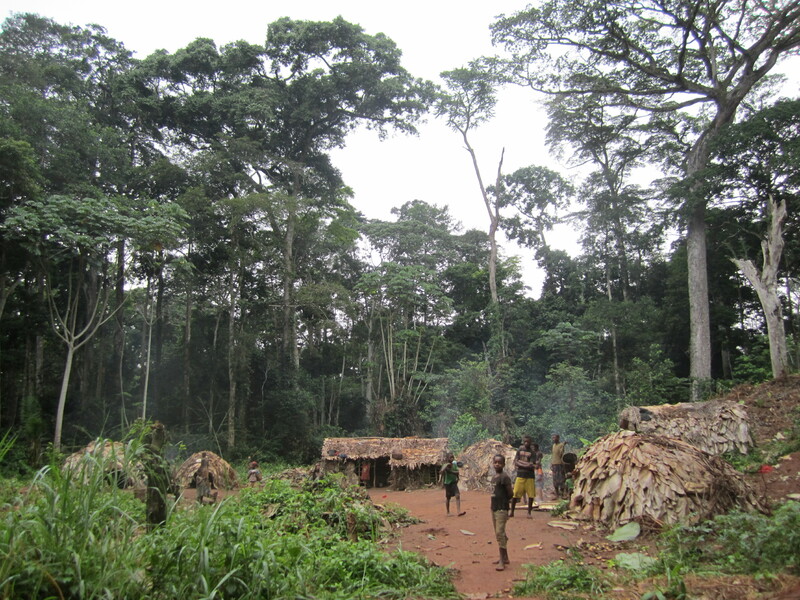 They describe themselves as Baaka (singular Moaka) — a word that denotes a regional and linguistic affiliation broad enough to span borders in central Africa, but indicating a subset of the people formerly called pygmies. They also use terms that are more restrictive still, such as Mbendjele — a dialect group within the Baaka. This is unfortunate, because Pygmy also has negative connotations, reflecting a long history of discrimination. After dinner, at Jerome’s suggestion, we prepare ourselves for a ceremony to introduce ourselves to the community and inaugurate our stay. We gather outside Jerome’s tent, and once he’s up, he leads us over to the main camp. Looking up at the canopy of trees and the darkening sky, I see a crescent moon; and a flash in the sky. As we walk along the road towards the camp, fireflies light up the space around us. It was one of them, I realize, that I’d taken for a shooting star. Jerome leads us into the clearing at the centre of the camp, and some women and children, sitting outside their houses, offer us stools to sit on. After a few minutes have passed and nobody else has appeared, Jerome summons the community. Soon the men of the camp, who had been eating indoors, come out and sit on mats on the ground. Jerome addresses the camp in the Mbendjele language, and attempts to explain the idea of a university, and the different areas of research that people might specialize in. “In our country there are people who study the moon and the stars; there are others who study the earth,” he says. The team he has brought here is doing research on people. They would like to stay with you here, he says. And they will explain to you what they will be doing. Then he turns things over to me. I speak in French, pausing after each sentence for Independant to translate. I try to distinguish us from missionaries on the one hand and conservationists on the other — two categories of foreigners that I assume they are familiar with. “Thank you for welcoming us into your community,” I say. “We respect your culture, your knowledge, your traditions. We have come here to learn from you. I make a mental note, and go on. “We’re also interested in understanding how people’s bodies change as they grow from children, to adults who hunt and gather, to elders. To illustrate, I jog around the roughly circular space in the centre of the camp, and mime taking notes on a few of the people who are seated on the ground as I go. “That will take just one day. I walk around the circle again now, more slowly, and squat next to one group of women and children. “If you have questions about any of these things, we’ll be happy to answer,” I say. Then an old man of the community responds. We are welcome to stay with them, he says. There aren’t many people in the forest now. The ecoguards [armed rangers who are officially responsible for protecting endangered species] have been harrassing people. 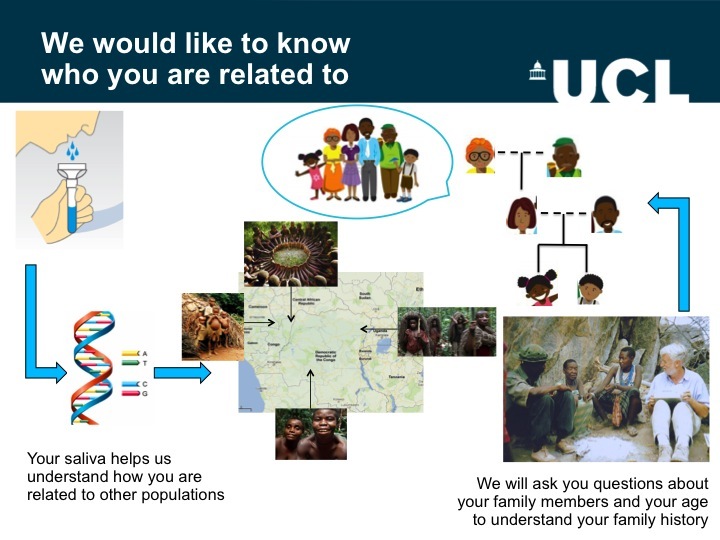 As a result, Baaka have come together in camps along on the road, and have gathered around the Bantu villages of the Yesua and Kabunga, near Minganga. I’m a bit surprised by this, and look to the others for guidance. At first, receiving signals I interpret as negative, I say no — tomorrow would be better. But very quickly the women and girls begin to sing, and once the song has begun, it’s difficult to tear ourselves away. Soon the whole community has joined in the music-making, clapping in complex rhythms. After some 20 or 30 minutes, dancers costumed in leaves — forest spirits — emerge out of the shadows. And then retreat, and reappear. Their faces are hidden, but from their movements they seem to be male. Some make bird-like sounds, while another hoots low and insistently like some kind of wild ape. They’re boys’ spirits, I overhear Jerome saying later; mobele, Esimba calls them. In the following days we get used to hearing singing and clapping; seeing men and women dance; and to the visitation of spirits. But somehow, no matter how often we hear people break into song — in this society without fixed schedules or formal leaders — it always seems like a surprise. B. Hewlett (1996). 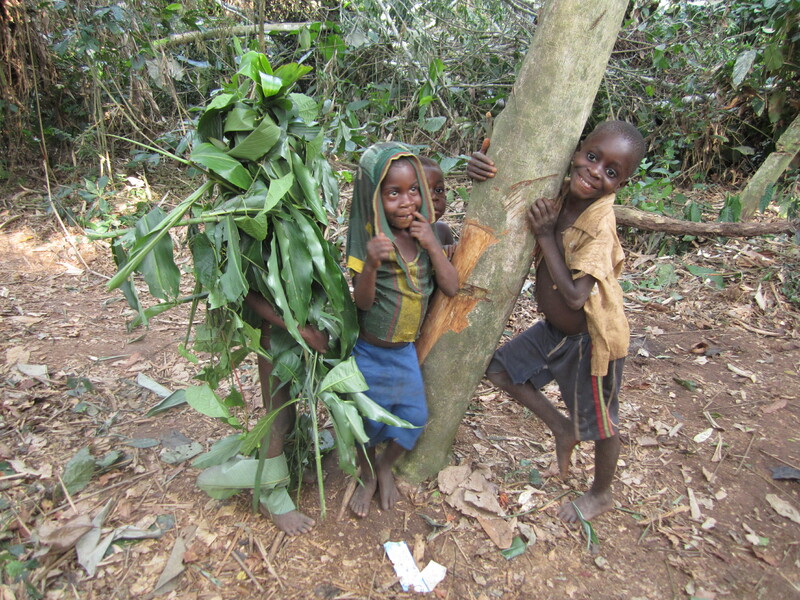 Cultural diversity among African pygmies. In S. Kent, ed. Cultural diversity among twentieth-century foragers: An African perspective. Cambridge: Cambridge University Press, pp. 215-333. This entry was posted in Congo and tagged anthropology, autochtones, ecoguards, environment, music, pygmies. Bookmark the permalink. The shot with the passing logging truck is great! Do you have any idea if the packbaskets shown in the photo are handwoven? I’ve read about and seen Mbuti textilery in museums (the nets are really something) but I don’t recall reading or seeing anything about groups to the west. Thanks! The baskets are definitely handwoven — I saw women making them. Would be interested to hear where you saw the Mbuti handicrafts. Don’t know if they are still on exhibit, but I saw them as part of a diorama in the AMNH’s Hall of African Peoples when I visited in the autumn of 2007. I like those dioramas. Colin Turnbull was curator of African Ethnology at the AMNH; it seems likely that it was he who brought the stuff to New York. Impressive knowledge! I searched the AMNH’s and you are (mostly) correctly! Turnbull put together the diorama and apparently most of the Hall in its current state. Some of the items in the diorama were acquired from Anne Putnam, whom he had boarded with while doing fieldwork, during his tenure. Nice to have that confirmed! Pity images of Anne Putnam’s paintings aren’t included on the Harvard online catalog. Thank you for interesting report to someone who taught cultural geography forty years ago. Thank you for reading, Mac!